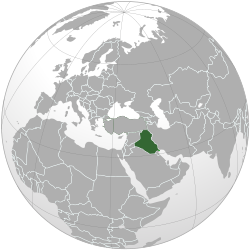 Ba'athist Iraq, formally the Iraqi Republic, covers the history o Iraq atween 1968 an 2003, in the period o the Arab Socialist Ba'ath Pairty's rule. ↑ "Americanchronicle.com". Retrieved 23 February 2017. This page wis last eeditit on 23 August 2017, at 17:11.